The Burrard Hotel was announced in the Contract Record in 1905 as being built on the corner of Homer and Cordova. 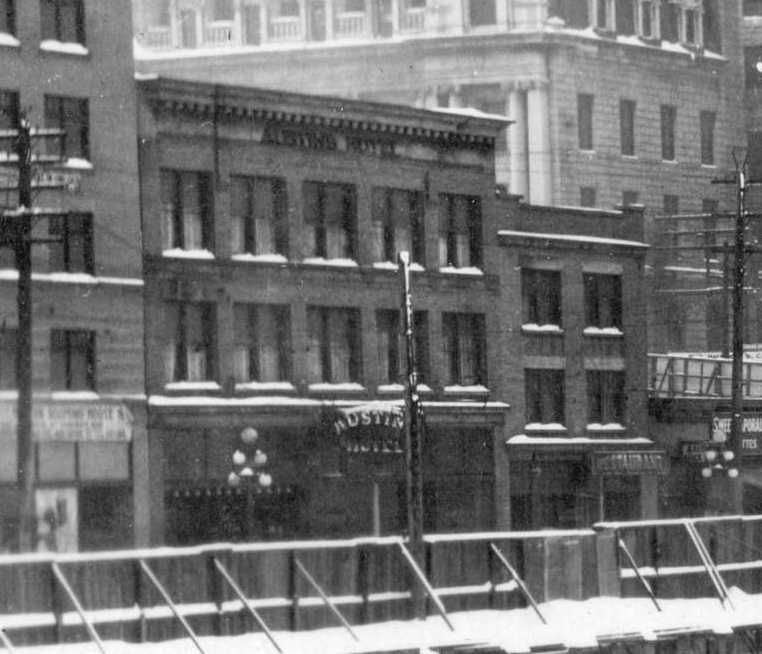 A year later the Cosmopolitan Hotel was recorded in the Street Directory as being on the same corner site – in 1907 the address disappears, and only in 1908 does the Burrard Hotel finally get a mention. The odd thing is that until 1906 (when the site was listed as vacant) there was a Cosmopolitan Hotel at 101 West Cordova. Mr David Gibb and his son built the hotel – the architects were Dalton and Eveleigh, and the Gibbs spent $16,000 on the site (according to a report in the Province newspaper in October 1905) and $25,000 on building the hotel. The report said they had already commenced construction of a three storey cut sandstone 40 room hotel. The newspaper report also explained how the site had previously been owned by Mr W J Van Houten and his associates who had previously planned a hotel deal with another party which had fallen through. In 1912 the owner was listed as Andy Johnson, who had a $5,000 permit to alter the hotel with Tolman & Co as the architect/builders. Tolman & Co were builders rather than architects; they also built Israel Powell’s Ashnola Apartments on Main Street at East 6th Avenue. Mr Johnson was a partner of Atkins Johnson and Stewart who built the Pacific Transfer Co warehouse on East Cordova in 1903. As can be seen – at some point the building had a fourth floor added – perhaps that was the work Mr Johnson commissioned. By 1919 the owner was Neil Cummins, who lived in New Westminster. The hotel had already transitioned in part to residential use; an auto salvage worker, a bartender at the Rainier Hotel, a carpenter and a clerk all listed the hotel as their residence. Three years later only the owners, Mr Cummins, and his partner Frank Vinnicombe were listed as living at the hotel. Our picture shows the hotel in 1933 – it seems to have been demolished in the early 1940s. The last directory entry is in 1940, when for some reason the address switched to Homer Street. In 1941 the hotel name lives on, but attached to a property on the 700 block of Richards Street. The site became a parking lot until the construction of the parkade that’s still there in 1954, which gained an extra two floors in 1978 when it was linked to the Harbour Centre redevelopment. The parkade structure on the other end of the block is older, dating back to 1933. Picture source, City of Vancouver Archives CVA 99-4408, Province newspaper extract from Heritage Vancouver. 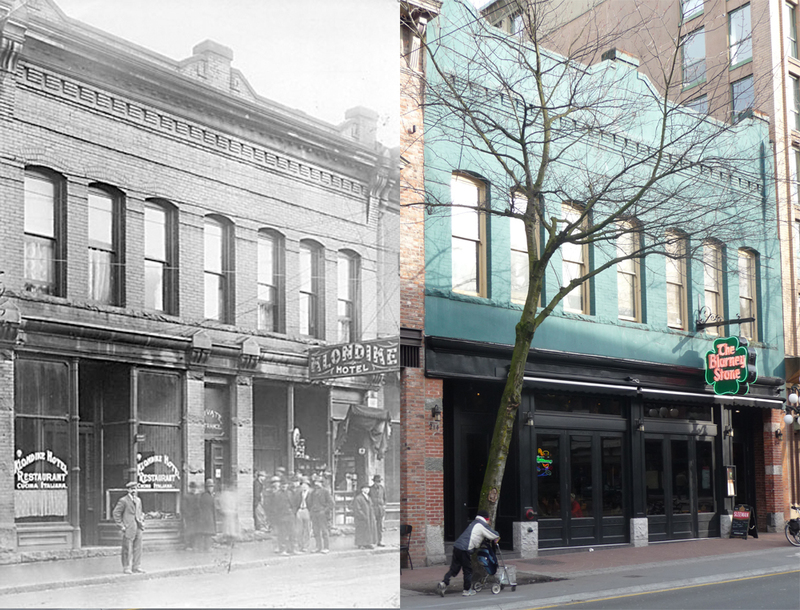 There’s been a Bodega Hotel on Carrall Street since 1887, soon after the fire that devastated the months old new city. This isn’t it – the original wooden hotel lasted just 13 years. 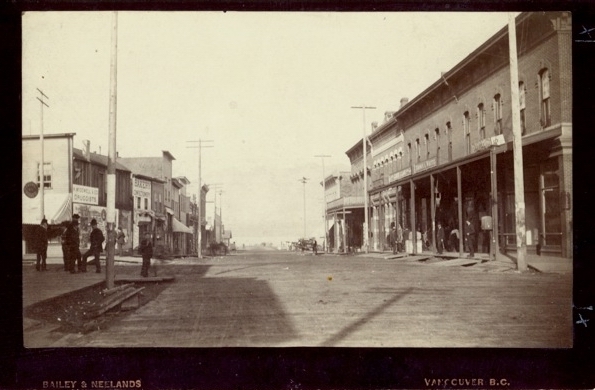 (The first Bodega is on the left in the postcard below – from around 1889). Joe Fortes, when he wasn’t at English Bay, was the barman in the hotel’s saloon. The building we see today is the 1900 replacement, built in more fire-proof materials and on a grander scale. J W Mallory (he was John Wesley Mallory) was the architect, and it’s the only surviving building he designed, in this case for John B Lovell. Lovell was an absentee landlord. Like the owner of the building to the north, the Alhambra Hotel, Lovell lived in Victoria. He was born in Buckinghamshire in England in 1831, moved with his family to the United States and then Canada in 1842. He moved to Victoria in 1858, and then on to the Cariboo where he mined in the gold rush, established a mercantile company and became postmaster in Glenora. He may well have known George Byrnes, the owner of the Alhambra/Byrnes Block as Byrnes was an auctioneer in Barkerville, and Lovell was a founding member of the Cariboo Masonic Lodge based in Barkerville. He returned to Victoria before 1879 and managed the BC Co-operative Company store on Douglas Street. In 1891 he was the census commissioner for the city of Victoria and in 1892 he was elected an Alderman and served on the Board of School Trustees from 1892 to 1896. Although the 1901 Census shows him as being retired, his retirement was presumably quite active as he built the Bodega in 1900. He also paid for repairs to 121 Water Street, a site he had bought from the Methodist Church in 1888. He died in 1915. In 1905 The Bodega was only the name of the saloon; the rooms upstairs were called the Oakland Rooming House. By 1910 they were back to the Bodega Rooming House. By 1920 it was the Bodega Cafe and the Bodega Hotel was upstairs and in 1926 the name changed to the Fraser Hotel, a name it retained for many decades – our image shows it in 1978. (Whether intentional or not, the name was appropriate as Angus Fraser’s house had stood on the site as early as 1877). Like most of the hotels in the area, the hotel eventually returned to being a rooming house, but in 1993 it was one of the earliest live-work studio condo conversions, designed by Marshall Fisher Architects. Today, among the retail tenants is LynnSteven, a clothing store with an award-winning MGB designed interior. 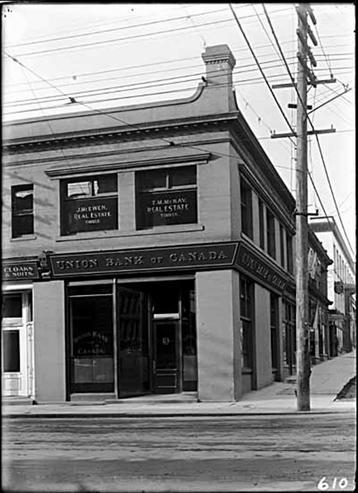 This rather simple 2-storey building was at 514 Cordova, away from the established centre of Gastown, but close to the CPR station. It sat in the middle of the block and in this picture dating back to 1887, just a year after the fire, you can see that the sidewalk has been levelled but the road still needs to be raised to meet it. The US Consular Agency were downstairs (with a huge Stars and Stripes on the roof), while upstairs William Kent and Eugene Talcott kept the Bayview Hotel. A variety of other tenants are listed – three with the designation ‘captain’ (Jones, Rogers and Holmes), E Teather an artist was here, as was Septimus Gough, an organist. At 518 John Canning kept a fruit store. By 1901 street renumbering had changed it to 614 West Cordova, the building was home to the BC Mining and Prospecting Exchange and the hotel was listed as The Grand. In 1906 Dalton and Eveleigh were hired to rebuild and expand the hotel on only two-thirds of the original site, and combining elements of earlier names it became Austin’s Grand View Hotel . (That’s it on the left in 1913, photographed across the construction site for the new station building). Proprietor Alf Austin played up his English roots (and sold Bass Burton Ale on Draught. A smaller building to the west housed the Park Rooms, designed by Maclure and Fox for H M Daly in 1911. To the east R J McDonald was hired by F W Padmore to design a much taller, narrow building completed in 1912 by W M Horie at a cost of $64,000. (There were two sequential permits for $50,000 and another for $14,000 – presumably signalling Mr Padmore’s decision to make the building taller). By 1925 this had become the Almer Hotel. By 1959 the block was run down, and the western end was cleared and replaced with the parking garage we see today. A few years later the St Francis and Almer Hotels were cleared away for 333 Seymour, designed by Tudor and Walters. Here’s the Blarney Stone (today’s name) as it was 99 years ago, by then called the Klondike Hotel and run by John Corrella (who seemed to be called Carralli in 1905, and while still in the building, was a tailor). In 1912 when the picture was taken it was already nearly 25 years old, having been built in 1889 as the Town and Robinson Block. We have featured a number of buildings designed by C O Wickenden – almost all of them now gone. This is one of the rare survivors, built by McGhie and McLuckie at two storeys, matching the other three buildings on the block (The Abrams, Glory Hotel and Ferguson Blocks). (For some strange reason there’s a suggestion it was originally four storeys – there’s no evidence that it was ever bigger or any different from the building we see today). Town and Robinson were almost certainly Henry Town and Isaac Robinson; both from England, and in Isaac’s case, as far as we can tell, never a Canadian resident. They developed several other properties including hotels on both Abbott and Water Street. The Daily World tells us Isaac Robinson was also a director of the Vancouver City Land Company, while Henry Town was of Arkley House, High Barnet. Both men were involved in a syndicate called the Vancouver Land Securities Corporation. Henry, who made his money in South Africa from diamonds, was married to the sister of prominent Vancouver realtors and developers the Rand Brothers, (from Nova Scotia) and towards the end of the 19th Century moved to the city. In 1889 the insurance map identifies it as having a vacant unit in the north half, and a crockery store to the south. Later it clearly incorporated the Klondike Hotel (visible in the 1913 picture) although in 1901 the Klondike is shown (both on maps and in the directory) as being in the Abrams Block to the south. 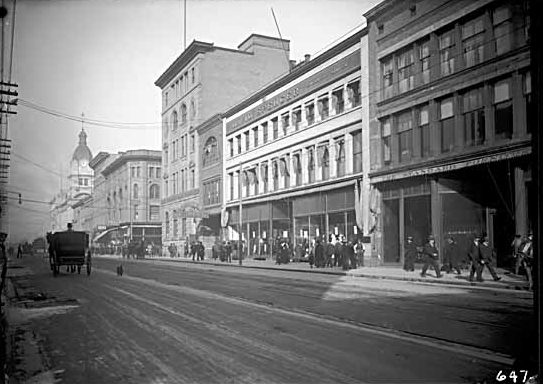 In 1901 the Town and Robinson building was called the King’s Hotel – by 1978 that name had moved back to the Abrams Block to the south. So basically the Klondike and Kings Hotel names appear to switch between the two adjacent buildings over the years. We don’t know if that actually happened, or the directory staff used the hotel bars to refresh themselves at the expense of accuracy. Over the years the tenants changed many times. In 1895 Mrs Sarah Gorman, a nurse, lived in the building and Creamer and Langley operated a plumbing supply business. Once it became the Klondike (almost always listed in the directory as the Klondyke), it stayed under that name for many years. By 1925 Angelo Pallazzo had a tobacco store in the ground floor, and by 1930 it was the New Cafe. By 1935 it had become the Government Liquor Store – said to be the first in the city. More recently it has been an Irish pub, and has been established a lot longer than many of the other bars and restaurants that have joined it in more recent years. The ‘Vancouver World’ published a supplement in 1890 which managed to illustrate it as the Innes-Thompson Block, and confusingly then refer to it in print as the Innes-Townley Block. F C Innes was undoubtedly one half of the development team. Like other important Vancouver developers R V Winch, G E Bower and Walter Gravely, Innes was a native of Cobourg in Ontario. He arrived in Vancouver in 1884 and teamed up in 1887 with Stephen O Richards (of Toronto) to operate one of the most dynamic real estate, insurance and brokerage firms in the city. Innes was third in line when the sale of Canadian Pacific lots was first offered. An 1890 profile said “They own and control some of the most desirable property in the city”. In 1888 he hired N S Hoffar to design a house on Hastings at Burrard. We are no further forward in positively identifying the Thompson – if there was a Thompson associated with this building – than we were with the block across the street. However, circumstantially Philip Nairn Thompson looks a likely contender here too; In 1896 Captain P Thompson occupied an office at 512 West Hastings (part of the Innes-Thompson Block) with prominent architect W T Dalton. If Innes partnered with a Townley, J W Townley, superintendent of the CPR in Vancouver is perhaps the more likely candidate. The building was not demolished until 1993, making way for the Delta Suites hotel in a massive project designed by Aitken Wriglesworth that included Conference Plaza and the retention of the Bank of Toronto next door, later to become the Wosk Centre for Dialogue. This is another building swallowed by the expanding Spencer retail empire. The Thompson-Ogle building (as it was identified on the 1901 insurance map of the city) was the earliest on the block. It’s the second building to the east of the Molson Bank in this picture. We don’t know who designed it, but it was completed before 1889 – it’s the only building on the block on the 1889 insurance map. However, it apparently took a while to complete; the 1890 Directory describes the building as ‘4 stores, unfinished’. 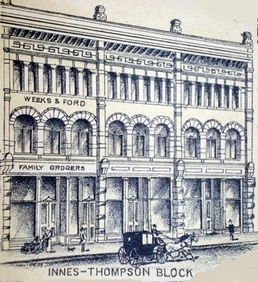 By 1901 it was known as the Thompson-Ogle Building, and labeled that way on the insurance map, but it actually started life as the Innes & Richards Building – seen in this 1890 Daily World illustration. by 1891 the first tenants have moved in; a number of civil engineers and the all-encompassing Vancouver Loan, Trust Saving and Guarantee Co, whose principle was H T Ceperley. Henry Tracy Ceperley was from New York state, a former Montana rancher who arrived in 1886 and went on to become one of the most important real estate brokers in the city. His long-time business partner, Frank Rounsfell was also with the VLTS&G Co, as bookeeper. Our main 1900 picture shows the four bay building, the outer bays on the top floor with triple windows of Romanesque curved arches, the centre bays with a larger single arched window. In case you were wondering, that’s the Tsimpsian brass band marching past. We don’t know for sure who the Thompson in the ownership of the Thompson Ogle Building was. There are only a handful of candidates, with the most likely being Philip Nairn Thompson, a wealthy Ottawa native who had moved to Vancouver by 1891, some years later joined by his brother and married sister. In 1891 the Williams Directory identifies the corner of Pender and Howe as having the Thompson Block, (possibly designed by R M Fripp) while Henderson’s Directory for the same year identifies the address for Captain Philip Thompson as being 504 Howe (the corner of Pender Street). In the 1898 Voter’s List Philip N Thompson was one of only two people in the entire list whose occupation was described as ‘gentleman’. Captain Thompson died in 1934, still in Vancouver, and reported in the Ottawa obitiary as being single. We’re suspect that Thompson also developed the Innes-Thompson block on the opposite side of Hastings. We think that the Ogle is most likely to be Edmund W Ogle, a Sheffield native whose sister-in-law had married pioneer John Morton. Ogle was in business with dry goods and clothing, buying Dan Drysdale’s business in New Westminster when his Vancouver store was destroyed in the 1886 fire. Ogle stayed in New Westminster, but by 1896 like Thompson was also living on Howe Street. The building was redeveloped in 1903 by Drysdale and Stevenson at a cost of $30,000. Wickenden’s Roman arches were replaced by Parr and Fee’s trademark white glazed bricks. In 1906 David Spencer managed to get into Vancouver’s retail market by buying first Charles Stevenson’s half share, and then in 1907 Gordon Drysdale’s other half of Drysdale-Stevenson. The Spencer family immediately started on the road to increasing and modernising the business. Despite the Spencer company intention to rebuild the entire block, this structure stayed as part of the store until it was demolished in the early 1970s to be replaced by the Harbour Centre development.